Or maybe a better title for this particular story is How to NOT plan your ranch vacation. If you want to de-stress even before you take your family on a gust ranch trip, then here’s a term you’ll want to study: The all-inclusive vacation. What a great concept for time-stressed parents. No hassles, no major planning required, just pack and show up at the ranch (or the airport–some ranches will arrange to pick you up from there). And Ranchweb can help you find ranches still offering all-inclusive vacations. Used to be, all dude ranch vacations came that way, but no more. The dude ranch industry has evolved to provide more customization—offering shorter, less costly trips and some inexpensive options that let you pay only for what you want (rather than one all-inclusive package). Still, the all-inclusive option has a lot to offer, including lodging, sports, all meals, riding lessons, and so forth for one price. 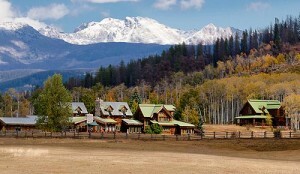 At some ranches, like Colorado’s Home Ranch (shown above), all inclusive means gourmet cuisine (some of the best dude ranch meals you’ll find), year-round multi-sport adventures and fly fishing guides (and gear), exceptional children’s programs, live music, roaring campfires, and even shuttle service to/from the airport. 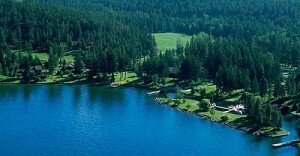 Some of the larger ranches like Averill’s Flathead Lake Ranch, provide all kinds of play and sports gear for your use and optional side trips to national parks, along major rivers, and more. Those kinds of extras can make it worth the sometimes price tag that comes with the all-inclusive option. But think of it this way: how much would you pay simply for tickets for a family day at the amusement park–not including meals, lodging, transportation and so on? Thinking of it that way, the all-inclusive price tag— including all your meals, lodging, and your choices of so many unique amusements—seems reasonable. 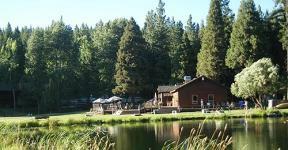 And some ranches, like California’s Greenhorn Creek ranch (shown at right) offer all-inclusive packages and activities for weddings, reunions, special interest groups, business/corporate meetings & retreats. It makes planning those types of trips a breeze. The all-inclusive option is designed to let parents relax and let kids have fun and a little (supervised) freedom in the great outdoors. Fresh air, great food, family bonding in a no-stress zone. That’s the promise of the all-inclusive ranch resort vacation.